Editorial Note - quotes from the Biblioteka Kombëtare website contained in this article are from the Google translated page and they are unedited; they therefore contain spelling, grammatical and other errors. 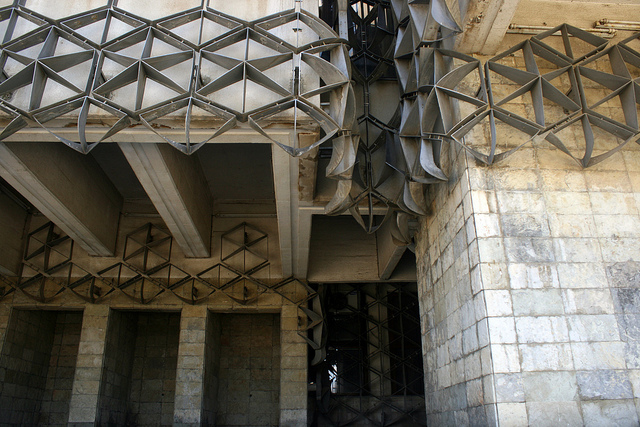 ... end result is a very striking, extraordinary and unique building. 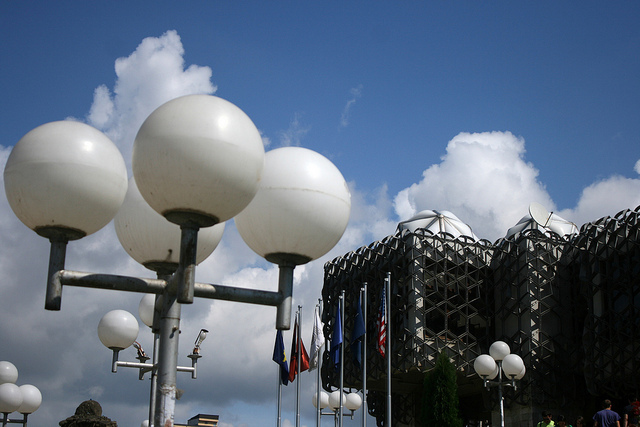 Constructed in 1982 the library was the creation of the highly regarded Croatian architect Andrija Mutnjakovic [English translation]. 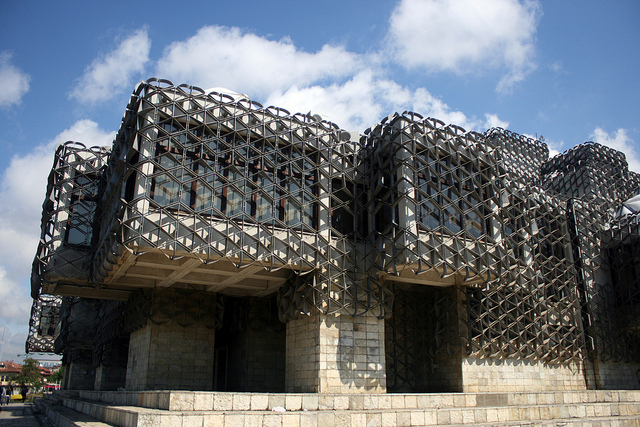 Mutnjakovic's career highlights include not only the creation of this masterpiece but also serving as the Honorary Director of the Croatian Museum Of Architecture, receiving the 2003 Vladimir Nazor Award from the Croatian Ministry of Culture and authoring several books. 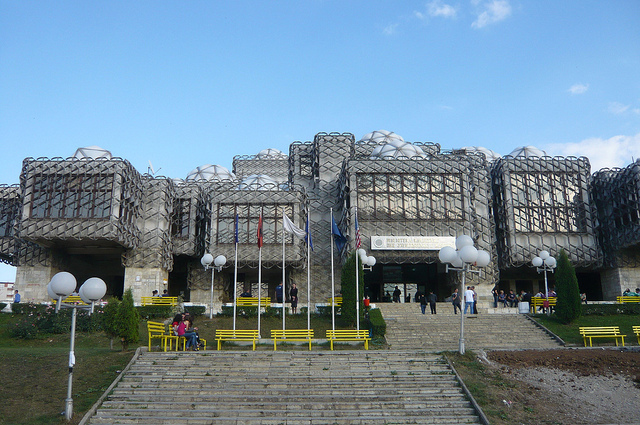 "the highest library institution in Kosovo. 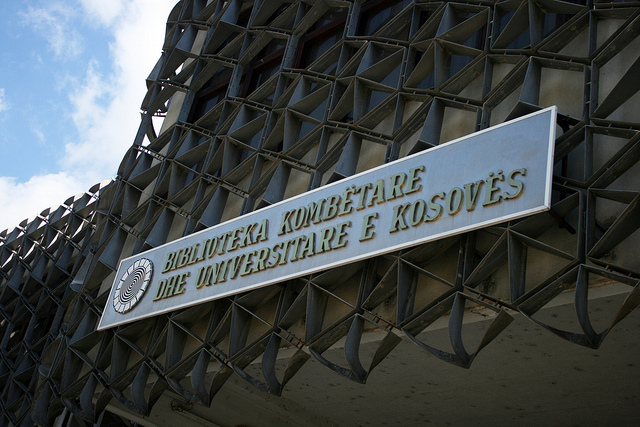 It was established by the Assembly, and is the main purpose of collecting and preserving the intellectual heritage of Kosovo and Kosovo. Its collections are a treasure of precious national heritage, regional and world." "NULK has a total of 16,500 square meters. 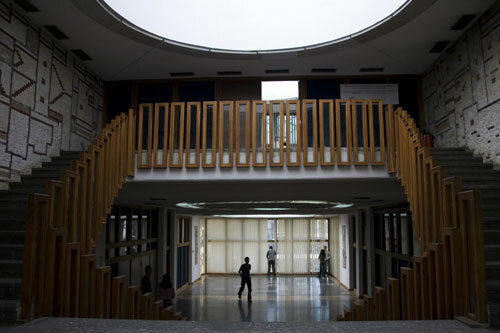 There are 6 floors, of which two floors are below ground and are designed to maintain t smell treasure of knowledge of the people of Kosovo and beyond. ..... 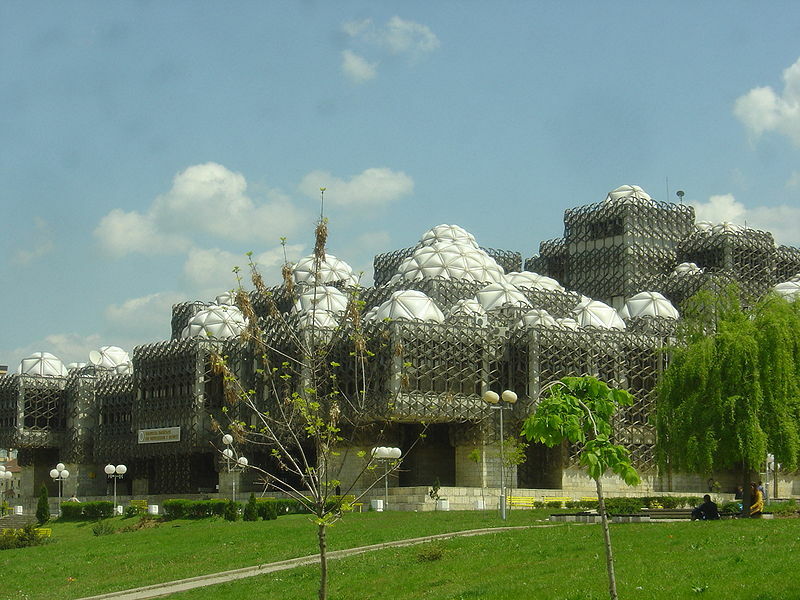 The library has 99 domes. The role and their primary function is to provide natural lighting in reading rooms and other spaces to work in NULK. Their design also offers decoration characteristic of external structure, but also the interior of the Library as a whole. Domes produce lighting effects that light and stored in memory as a journey through the universal sense of national Plisi white appearance of a brain (knowledge)." "around 2 million units library. Its collections include various materials such as books, magazines, journals, scores, manuscripts and old books and rare gramophone records, maps, photographs, MA PhD work, etc.."
The current collections housed at the library also include over 5,000 fine examples of old and rare books and manuscripts, dating back as far as the 16th century. "When you build a library that looks like a military base in a potential war zone, then you can't be all that surprised when armed forces take it over as a base once the trouble starts. Such was the fate of architect Andrija Mutnjakovic's 1982 building, which was occupied by the Serbian army, serving as its commando HQ during 1999." 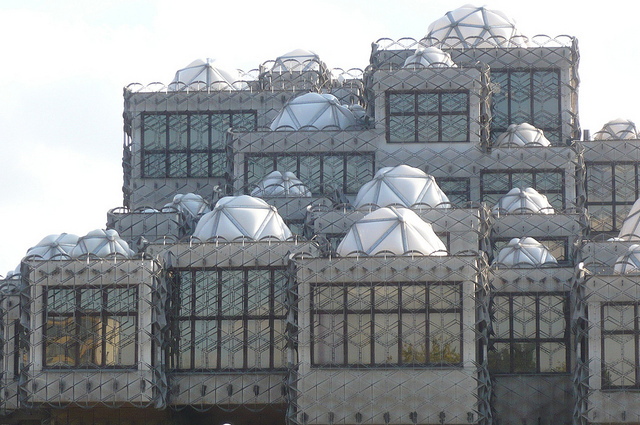 in an article entitled "Are These The World's Ugliest Buildings?". 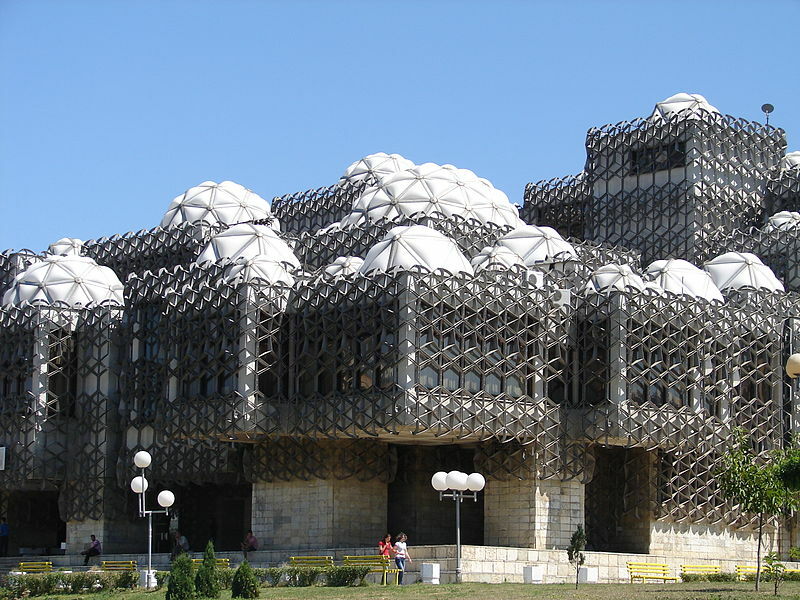 I have to say that I for one would certainly not include the Biblioteka Kombëtare in such a list; in fact just the opposite, I think that while it is strange it is also very cool and actually looks rather attractive. I guess it simply speaks to the assertion I make in this blog's header that architecture ought to be considered an art form and that "Architecture, like beauty, is in the eye of the beholder". I located a tourist video of the building which includes some interesting footage and include it below on the video tab; however be warned that about half way through the video seems to start to concentrate more on, presumably, the wife and then for some reason on a man I can only assume was a local doing some gardening. There is not much footage of the building after this point. 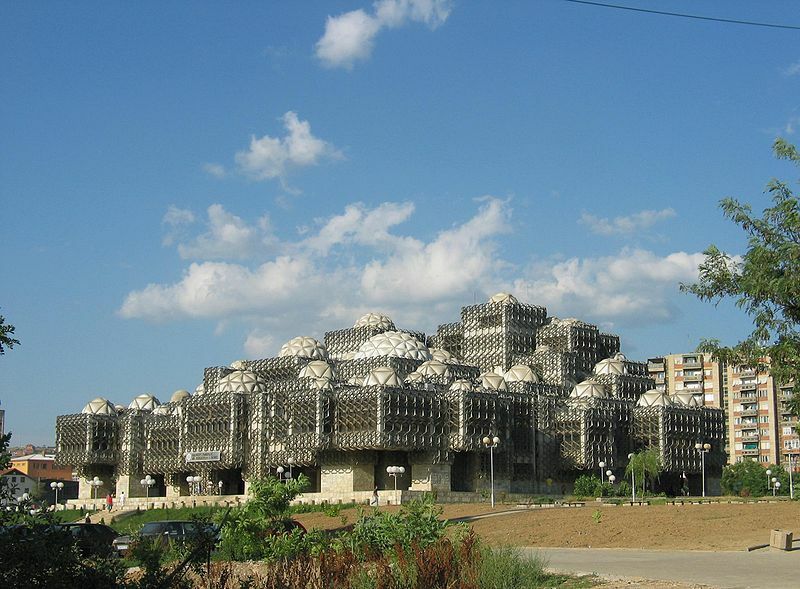 I taught at the University of Prishtina in 2001 just after the Kosovo War, and my students informed me that the library exterior was designed to resemble the human brain. Interesting metaphor, no? !